With the economy being what it is, it shouldn't be too hard to channel the spirit of 1933. 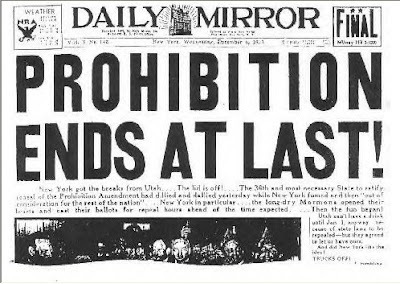 Great Depression aside, there was something to celebrate that year — the end of Prohibition — and this Friday, Dec. 5, you can toast the occasion all over again. The DC Craft Bartenders’ Guild is hosting a Repeal Day party at the historic City Tavern Club in honor of the 75th anniversary of the date the 18th Amendment was repealed. The party kicks off at 8 p.m. with a jazz band, hors d'oeuvres and classic cocktails, recreated by DC's best bartenders, including Owen Thompson of Bourbon, Gina Chersevani of EatBar and Derek Brown of The Gibson. Special guests will include Tony Abou-Ganim, host of Fine Living’s “Raising the Bar,” Jeffrey Morgenthaler, founder of RepealDay.org, and other top bartenders from around the country. Tickets are $90 and proceeds benefit the club’s Preservation Fund and the Museum of the American Cocktail. Dress for the soirée is sophisticated cocktail attire. The City Tavern Club is located at 3206 M St. NW. To buy tickets, visit dccraftbartendersguild.org.